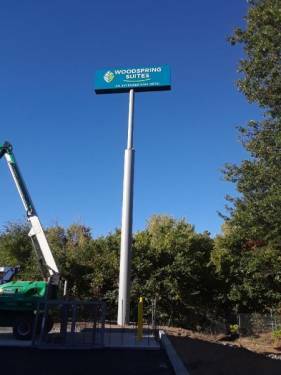 Portland Bolt supplied the 1-3/4” diameter hot-dip galvanized F1554 Grade 36 rods that were required to anchor the 65’ tall ‘Woodspring Suites’ pylon sign to the concrete foundation. Due to the height and weight of the sign structure, 1-3/4” diameter by 48” long anchor bolts were specified by the project engineer. Portland Bolt was able to manufacture the anchor bolts in our facility where we also applied the hot-dip galvanized zinc coating. In addition to our manufacturing capabilities, we also inventory a complete line of hex head and 90 degree anchors from ½” diameter through 1” diameter, many in plain steel and hot-dip galvanized finishes. Portland Bolt also keeps a handful of anchor rods on hand that are standard parts for nearby state Departments of Transportation. Often times, these stock anchors can be used outside of their standard application due to having a similar size to a specified anchor bolt that is needed in a fast turnaround.